Robert Elgie is the Paddy Moriarty Professor of Government and International Studies and a Member of the Royal Irish Academy (MRIA). He gained a First Class Honours degree in Philosophy, Politics and Economics from Oriel College, Oxford University in 1987. He graduated with a PhD in Government from the London School of Economics, in 1991. Since this time, he has published more than 40 articles in international refereed journals, as well as four single-authored monographs, two co-authored books, seven edited and co-edited books, and more than 30 book chapters. He is the editor of the journal French Politics. He is the Review Editor for the journal Government and Opposition. He is also the lead co-editor of the Oxford Handbook of French Politics published by Oxford University Press in 2016. 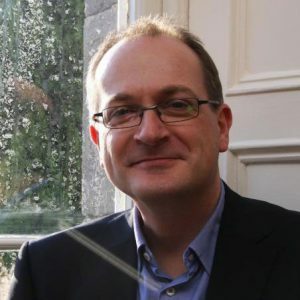 He has received funding on four occasions from the Irish Research Council for the Humanities and Social Sciences, including a Senior Research Fellowship for 2009-2010. He has supervised numerous PhD students to successful completion. He is well known for his work on semi-presidentialism and his definition of the concept has been adopted as the scientific standard. His most recent book on this topic is Semi-Presidentialism published by Oxford University Press in 2011. He has also published extensively on political leadership and French politics. His work has received considerable external recognition. His invited talks include presentations at the Parliament of Portugal and the Seimas (Parliament) of the Republic of Lithuania. He is a member of the network of experts on the Constitution Building Processes (CBP) Programme at International IDEA. In April 2012 he was formally asked to provide a briefing report on Constituent Assembly of Nepal’s proposed system of government. In January 2013 he was asked to give an expert presentation to the Convention on the Constitution for the proposed reforms to the presidency of Ireland. Elgie, Studying Political Leadership: Foundations and Contending Accounts, London, Palgrave, 2015. Elgie, E. Grossman, and A. Mazur (eds. ), Oxford Handbook of French Politics, Oxford: Oxford University Press, 2016. Elgie and S. Moestrup (eds. ), Semi-presidentialism in Central Asia and the Caucasus, London, Palgrave Macmillan, 2016. Doyle and R. Elgie, ‘Measuring presidential power’, British Journal of Political Science, vol. 46, no. 4, 2016, pp. 731-741. Elgie, ‘Varieties of Presidentialism and of Leadership Outcomes’, Daedalus, vol. 145, no. 3, 2016, pp. 57-68. Elgie, ‘Semi-presidentialism and Governability’, Assembleia da República, Portuguese Parliament, Lisbon, 2016. Elgie, ‘Presidentialisation and the Personalization of Parties: An Ongoing Debate’, University of Rome I – La Sapienza, November 2015. Elgie, ‘What do we know about semi-presidentialism?’, University of Bucharest, 2015.